Sometimes when I hear of events in Zimbabwe, all I can think is “Zimbabwe, ka”, while I shake my head in judgment/weakness. Although not one of such events, this last weekend saw thousands of fans in Zimbabwe disappointed after Timbaland failed to arrive for his scheduled performance in H-Town alongside Ciara, Lil’Kim, Fat Joe and DJ Scratch. The concert promoter, Kenny Kunene (better known as Mr Sushi King) apparently came out onto the stage and apologised for Timbaland’s absence and said, by way of explanation, that part of the problem was that “Timbaland loved Zimbabwe so much that he had to travel in a private jet”. Huh? Er, Kenny, that’s not really an explanation. I’m more confused now than I was initially, thanks. Nevertheless, the other performers, especially Ciara and Lil’Kim, gave the crowds “top drawer performances”. Yes, top drawer performances is how it was described. If anyone can tell me 1) whether this is actually a legit phrase 2) where it came from, I would sincerely appreciate it. At the same time as the abovementioned top drawer performance was going down, a *smh* in judgment/weakness event was taking place in Beitbridge. 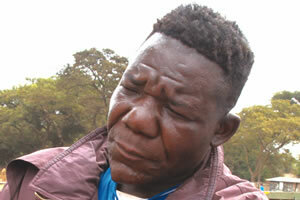 Bulawayo-based Austin Mbewe was crowned this year’s Mr Ugly Unlimited. Apparently it was a tightly contested pageant. Mbewe “was crowned on Saturday night at Pagomo Heights Leisure Centre in a fun-filled occasion attended by hundreds of people, some of them from as far as Bulawayo and Harare. The venue was filled to the brim with long winding queues of cars along the road to Pagomo Heights”. I really hope that the journalist who wrote the article is being a bit melodramatic, that Mr Ugly isn’t the event of the year in Beitbridge… but, then again, it is Beitbridge, you never know. The pageant, which “had the blessing of the National Arts Council and the Zimbabwe Tourism Authority”, and whose judges were all women, initially had “a total of 15 ugly men [who] were expected to outclass each other on the ramp but six developed cold feet at the eleventh hour”. The remaining 9 continued and battled it out in the categories of smart, smart casual, sports and safari. Yes, safari. For the first time, “the pageant had two Mr Ugly Personalities, in the form of Thomas Magwegwe and Touchmore Denyathi, both of Beitbridge”. I don’t really understand the “Mr Ugly Personality” title. I’m assuming that their personalities aren’t ugly and reckon that the organisers should maybe rephrase it. No? As far as the title of Mr Ugly Unlimited was concerned, though, apparently, “Mbewe was undoubtedly the deserving winner as he moved the crowd from the onset when he took to the ramp. He shrugged off a challenge from Chitova and Chiramba, but at the end of the day everyone agreed he was the right man for the Mr Ugly throne”. Sha, to be called “undoubtedly the deserving winner” in a Mr Ugly pageant is rough, but he got R1200 and a blanket as a prize and seemed pretty chuffed with his victory. Initially, I thought that having a Mr Ugly pageant is rather mean, but show organiser, Lovemore Chonzi, explained that “basically the competition is meant for people to have fun and celebrate who they are just like any other contests in the world.” He continued, saying that the show is growing year-on-year, with contestants now coming from as far as Bulawayo, Mbalabala, Masvingo, Kwekwe, Tshaswingo and Zaka. Mbewe added to this, saying, “I feel greatly honoured by this victory, I have been a subject of ridicule from society since childhood and the world has seen that there is a beautiful side to my ugliness. I am very confident with my natural looks and confident about it. It was a tight contest but at the end of the day my hard work was rewarded”. Mbewe’s words make me feel rebuked for judging the show. He made me realise that Mr Ugly is more than just an excuse to have a party and it isn’t something that I should be laughing at. In Zimbabwe’s highly conservative and deeply divided society, embracing people from across the country who have carried such baggage their whole lives, and bringing them together in celebration is exactly what we should be about. And I think that it’s admirable for people to take part in such a competition and to celebrate who they are. It’s something we should all do far more than we do. And yay for Zimbabwe being a little avant garde. Whoop whoop. (For purposes of trying not to judge Mbewe, try to ignore the turban/tiara vibe on his head… ya, it’s just a little much).